The philosopher, scientist, orator, and author Francis Bacon said, “Knowledge is power.” I believe this to be true and so do many others. In this game, the more you learn, the more options you have. But knowledge and power come at a price. 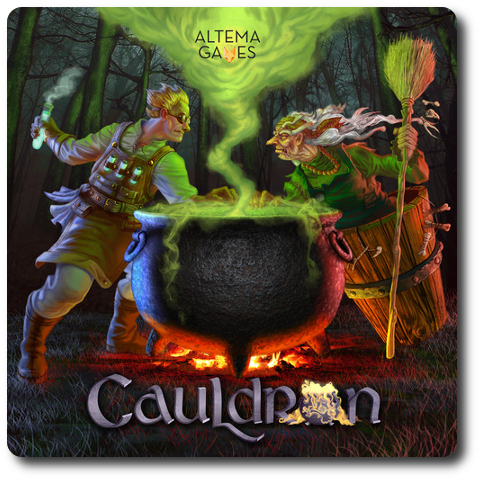 Cauldron, designed by Artem Safarov and to be published by Altema Games, will reportedly be comprised of 1 Magik Track game board, 10 “Used” tokens, 8 “Swamp” Field tiles, 8 “Cobweb” Field tiles, 8 “Toadstool” Field tiles, 5 “Blood Crystal” Field tiles, 5 “Dragon Egg” Field tiles, 5 “Mandrake Root” Field tiles, 5 “Snake Skin” Field tiles, 24 “Frog leg” Ingredient tokens, 24 “Spiderweb” Ingredient tokens, 24 “Mushroom” Ingredient tokens, 15 “Blood Crystal” Ingredient tokens, 15 “Dragon Egg” Ingredient tokens, 15 “Mandrake Root” Ingredient tokens, 15 “Snake Skin” Ingredient tokens, 35 Basic Potion cards, 22 Advanced Potion cards, 51 Basic Spell cards, 36 Advanced Spell cards, 46 Omen cards, 12 Cellar cards, 7 Character cards, 7 Character tokens, and 5 standard six-sided dice. As this is a review of a prepublished game, I will not comment on the game component quality. The artistic talents of Alina Marchewka, Polina Radtchenko, and Christina Simmons bring Cauldron visually to life. The game is both moody and vibrant with color, suggesting hidden laboratories, dark dens, and bubbling vials of brightly colored potions. To set up the game, first give each player 1 Character card and its matching Character token. 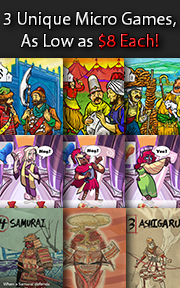 Each character is unique (abilities are described on the Character cards), allowing each player to come at the game in a slightly different way than their opponents. No single character is more powerful than another, however, and players should feel free to deal out the Character cards randomly if they like. However, since each character is played in a unique way, it’s worthwhile to let players select the character that matches their playing style. Any Character cards and Character tokens not selected are returned to the game box. Second, take the Magik Track game board and place it to one side of the game playing area. Not the middle. Now take the Character tokens and place them on the “Start” space on the Magik Track. This game board records the character’s knowledge of Magik which serves as both currency and victory points in the game. Third, build the starting Field where players will scramble to quickly collect ingredients. Collect 1 “Cobweb” Field tile, 1 “Frog Leg” Field tile, and 1 “Toadstool” Field tile. Then collect 1 more of each for every player in the game. For example, in a 3 player game, you would collect 4 “Cobweb” Field tiles, 4 “Frog Leg” Field tiles, and 4 “Toadstool” Field tiles. Shuffle the Field tiles and then place 2 in the middle of the playing area so they are adjacent. Then add the remaining Field tiles, one at a time, so the previously placed Field tiles are always adjacent to at least 2 other Field tiles. Place all remaining Field tiles and their matching Ingredient tokens to one side of the Magik Track game board. This area is referred to as the “General Supply”. Place the “Used” tokens in the General Supply, as well as the dice. Fourth, separate the cards by type to form 6 decks. These will be Basic Potions, Advanced Potions, Basic Spells, Advanced Spells, Omens, and Cellar decks. From the Basic Potions deck, find and set aside the 6 Basic (Easy) Potions cards. Shuffle the remaining decks separately and place each face-down next to the Magik Track game board. Fifth, shuffle the Basic (Easy) Potions cards and deal 1 out to each player, face-up. In this game, Potion cards are always visible to the players at the table. Spells, however, are kept secret. Any Basic (Easy) Potions cards not dealt are removed for the duration of the game. Then deal each player 1 Basic Potion card face-up and 2 Basic Spell cards face-down. This is the player’s starting hand. That’s it for game set up. Time to make some toil and trouble. Cauldron is played in rounds and turns with no set number of rounds in a single game. A round is broken down into seasons, which are further broken down into steps and turns. A typical game round is summarized here. The first season focuses on gathering ingredients, using them to make potions, casting spells, and gaining as much Magik as possible. Players should pay special attention to their Character cards to ensure they don’t miss opportunities to take advantage of special abilities during this season. At the start of each Harvest Season, the top-most Omen card is drawn, read out loud, and resolved if possible. Then the card is discarded face-up and left visible in case the Omen card’s effects last for the duration of the Harvest Season. From the General Supply, add 1 matching Ingredient token to each of the Field tiles in play. 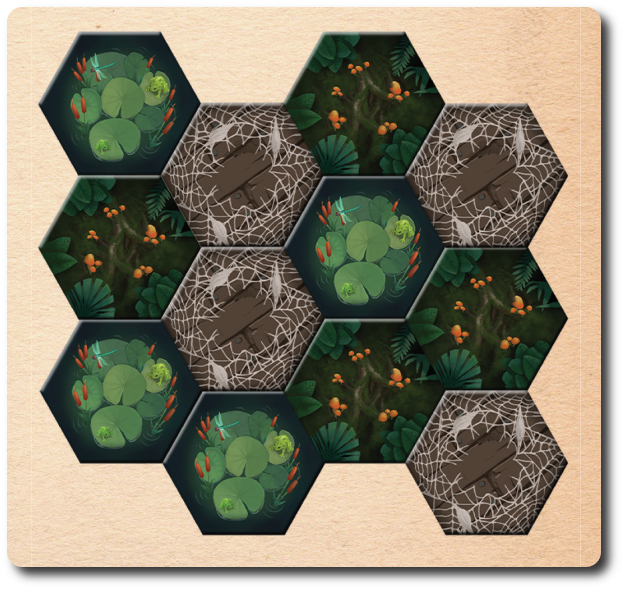 For example, the “Cobweb” Field tile is given 1 “Spiderweb” Ingredient token. Some Omen cards might alter this step in the game by either adding more Ingredient tokens or less. 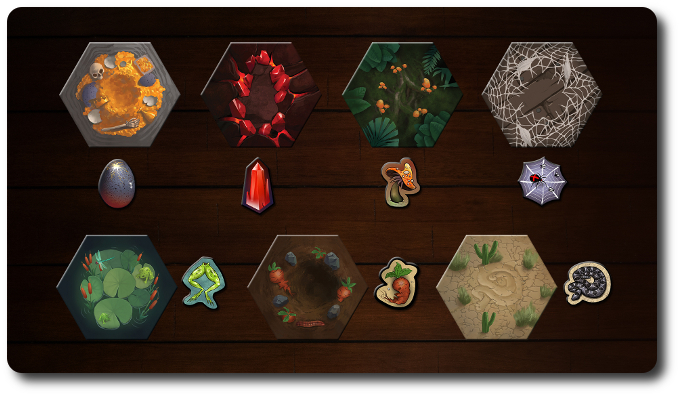 As the game progresses, different Field tiles will be added, which means different Ingredient tokens to place and collect. Each player now takes a six-sided die and rolls it. The player who rolls the highest number goes first with turn order continuing clockwise around the table. In turn order sequence, each player will now take 1 action and 1 or more possible quick actions. A player can only take 1 action per turn, but a player can take multiple quick actions before or after a player’s single action. When the player is done, the next player takes their turn. This continues in clockwise order until all the Ingredient tokens are removed from the Field tiles. The following actions are available to the player on their turn. A player must take 1 action (and only 1) if possible. 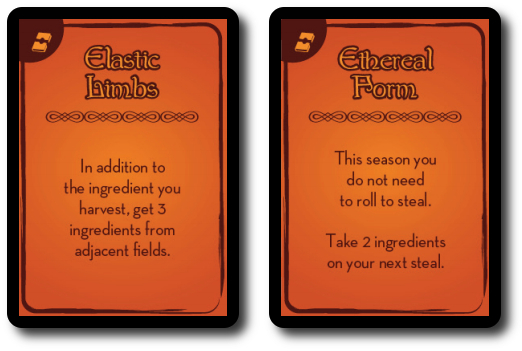 Harvest: Take 1 Ingredient token from a Field tile and place it next to the Character card. This is the player’s Personal Supply of Ingredients. Steal: Point to an opponent and announce an attempt to steal an Ingredient token. Roll a six-sided die. If the roll is 4 or higher, 1 Ingredient token is taken from the targeted opponent’s Personal Supply and added to the player’s Personal Supply. Unless otherwise noted, any Ingredient tokens located on a Cellar card cannot be stolen. 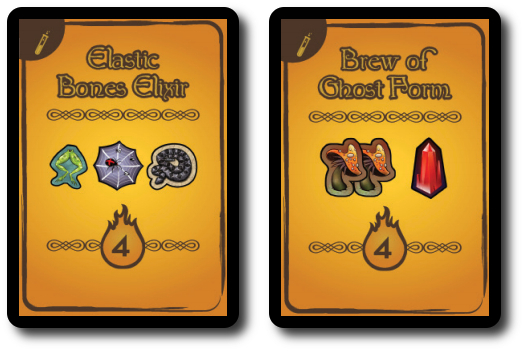 Brew: Take the type and number of Ingredient tokens noted on a Potion card and return them to the General Supply. Some Potion cards might have a “?” for an ingredient which indicates that any Ingredient token can be used. The noted Magik value on the Potion card advances the player’s Character token that many spaces on the Magik Track game board. If the Potion card has the keyword “Spell”, the player also collects 1 Basic Spell card upon completion of the potion. The player’s Potion card remains with the Character card and can be used again as soon as the right ingredients are collected. The following quick actions are available to the player on their turn. There are no limits to the number of quick actions the player can take, but nor is the player required to take any if they don’t think it in their best interest. Brew Quick Potion: This is just like the slower version of brewing a potion, but it doesn’t count as the single action. The Potion card will have the keyword “Quick”. This is a neat Potion card to have, as it allows a player to harvest ingredients and brew a potion on a single turn. However, these Potion cards tend to provide less Magik. Move Ingredients: If the player has a Cellar card, any number of Ingredient tokens can be moved from the player’s Personal Supply to the Cellar card for safe keeping, but only 1 Ingredient token can be housed in the Cellar at a time. Cast Spell: Spells give the player a temporary, albeit powerful, advantage. 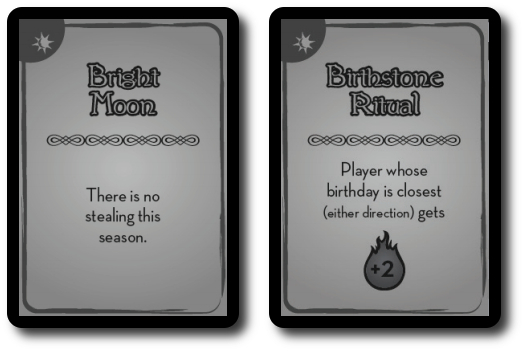 Spell cards can be cast at anytime during the player’s turn and as many spells can be cast as the player likes. Once cast, they are resolved and then discarded. 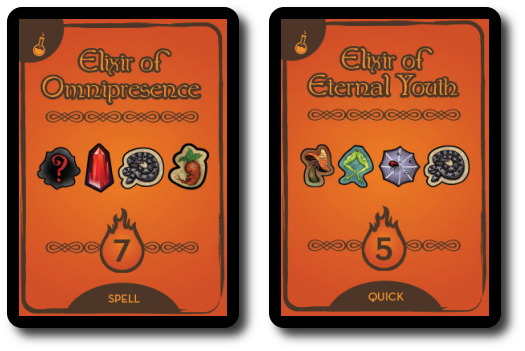 Spell cards collected as part of a successful potion brewing can be used on the same turn they are collected. If the Spell card has the keyword “Instant”, it can be used during an opponent’s turn to cause mischief. However, there are limits to this seemingly powerful tool. Each player (unless a Character card says otherwise), can only hold a total of 3 Spell cards. This can be a mix of both Basic and Advanced spells. Spells can be canceled just as easily as they are cast and some powerful spells can even cancel the ability to use magic. Finally, Spell cards can only be used during the Harvest Season. When the last Ingredient token is taken from the Field tiles, the Harvest Season comes to an end. The player who took the final Ingredient token can take as many quick actions as they like, but they cannot take any other action. Then return any Ingredient tokens still in the players’ Personal Supply back to the General Supply. All of the collected Ingredient tokens not used have spoiled and are now useless. Any Ingredient tokens on a player’s Cellar cards remain with the player. 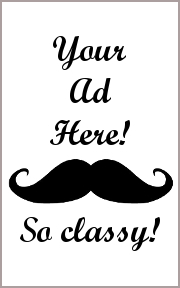 These keep and can be used later. Players do not have access to a Cellar card when the game first starts. However, if they so wish, players can invest in a Cellar card during the next half of the round. If the Harvest Season is all about gathering and producing, the Market Season is all about focusing and restocking. Like the first half of the round, the second half is broken down into steps and turns. The next player in turn order sequence after the player who ended the Harvest Season starts the Market Season. Each player, starting with the first player for this season, may make a single purchase from the Market. The only currency in this game is Magik. When purchasing from the Market, a player must be able to pay the listed amount by reducing their Magik score on the Magik Track game board. If it’s not readily obvious, players are using their hard-earned victory points. Needless to say, spend your Magik wisely. Before spending any Magik, players should review their Character card. Some characters provide discounts and bonuses during the Market Season. Buy 1 Field Tile (3 Magik): Any Field tile not yet being used can be selected and placed in the middle playing area with the already in use Field tiles. The new Field tile must be placed adjacent to any other Field tiles. After placing the Field tile, the player collects 1 matching Ingredient token to be used during the next round. Buy 1 Basic Spell Card (1 Magik): Draw the top-most Basic Spell card and add it to the player’s hand. Unless otherwise stated, the player can only have a maximum of 3 Spell cards (Basic and Advanced) in total. If the player has more than 3 Spell cards after purchasing a new one, they must immediately discard down to 3 Spell cards. Buy 1 Basic Potion Card (x Magik): Where “x” is equal to the number of Basic Potion cards the player already owns. For example, if the player had 5 Basic Potion cards, a new Basic Potion card would cost 5 Magik. When the Basic Potion card is purchased, it’s placed in front of the player face-up. Buy 1 Cellar Card (3/4 Magik): The first Cellar card purchased by a player costs 3 Magik and the second costs 4 Magik. Unless otherwise noted, players can have a maximum of 2 Cellar cards during the game. When purchased, they are placed next to the player’s Character card. 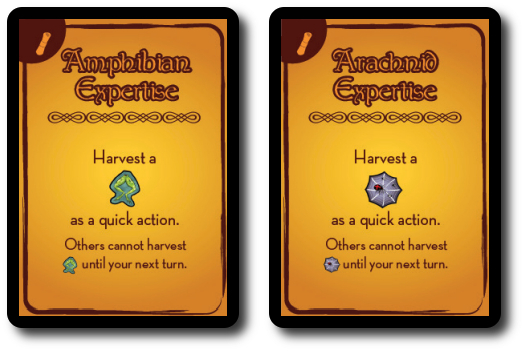 The Cellar cards can hold 1 Ingredient token at anytime during the Harvest Season and moved as a quick action during the player’s turn. Ingredient tokens located on the Cellar card are kept by the player at the end of the Harvest Season instead of being discarded. Cellar cards also keep Ingredient tokens safe from would-be thieves. Some purchases are only possible after 1 or more players earn a specific amount of Magik. As the game and player’s progress, there are certain points on the Magik Track that trigger continual effects that benefit players who meet the effect’s requirements. One of the points is named “Rituals of Power”. After a player obtains enough Magik to trigger the Rituals of Power, Advanced Spells and Advanced Potions can be purchased. Buy 1 Advanced Spell Card (3 Magik): Draw the top-most Advanced Spell card and add it to the player’s hand. Buy 1 Advanced Potion Card (x Magik): Where “x” is equal to the number of Advanced Potion cards the player already owns, +2. For example, if the player had 5 Advanced Potion cards, a new Advanced Potion card would cost 7 Magik. When the Advanced Potion card is purchased, it’s placed in front of the player face-up. After all the players have purchased from the Market or passed, the round ends. The next round now begins starting with the Harvest Season. It’s worth discussing the Magik Track game board in a bit more detail. Other than the points previously mentioned on the track that allow for Advanced Spells and Advanced Potions to be purchased, there are also “points of no return” that permanently change how the game is played for the duration of the game playing session. For example, after obtaining 25 Magik, any Potion card the player has that only takes 2 Ingredient tokens no longer work. Additionally, depending on where the player’s Character token is located on the Magik Track game board, they will or will not receive bonuses. This creates an entirely different aspect of the game that the players can now use to their advantage. 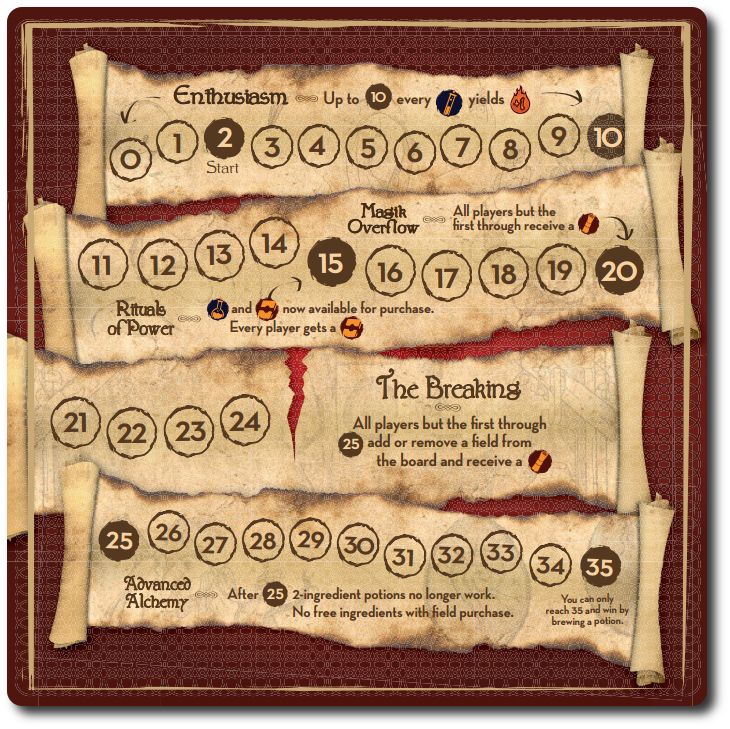 By managing their position on the Magik Track game board, players can get bonuses that will propel them forward, but not across the finish the line. Like everything else in Cauldron. there are a number of ways to advance, but no one specific way will give the player unquestionable victory. The game continues as summarized above until a player earns 35 or more Magik. This player has won the game and is given the title “Grand Infusionist”. They have reached a new plateau of power and knowledge that cannot be equaled. A number of game variants are available for those who are looking to change the game. They are summarized here. For a faster game, remove the Spell cards from play and ignore any Omen cards that mention spells and any mention of spells on the Magik Track game board. The “Wizard” Character card should also be removed from the game. Without Magik, the Wizard is really nothing more than an old guy in a long bathrobe. For a more difficult game that allows for deeper strategy and more tactics, players are allowed to purchase from the Market twice instead of once. Expect games using this rule to take up to 2 hours to complete. If you don’t care for random results to dictate game options, always draw 2 Spell and 2 Potion cards when purchasing them, review both, and then discard 1, keeping the other. Instead of rolling the dice to determine turn order, the first player is always the player with the least amount of Magik. Omen cards that make mention of turn order rolls are ignored. 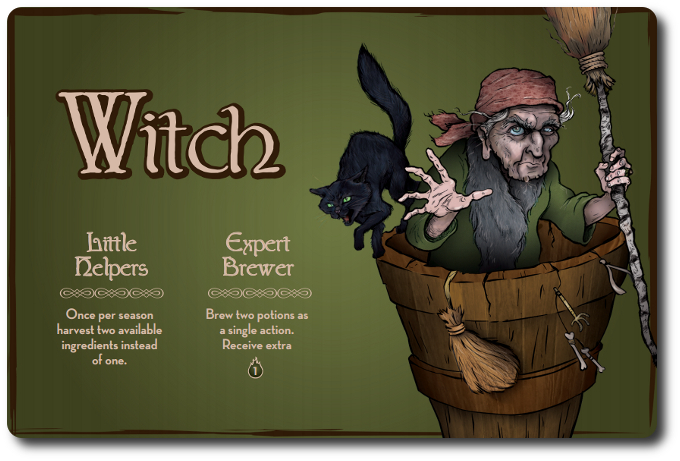 To learn more about Cauldron, visit the game publisher’s website or visit the Kickstarter campaign. 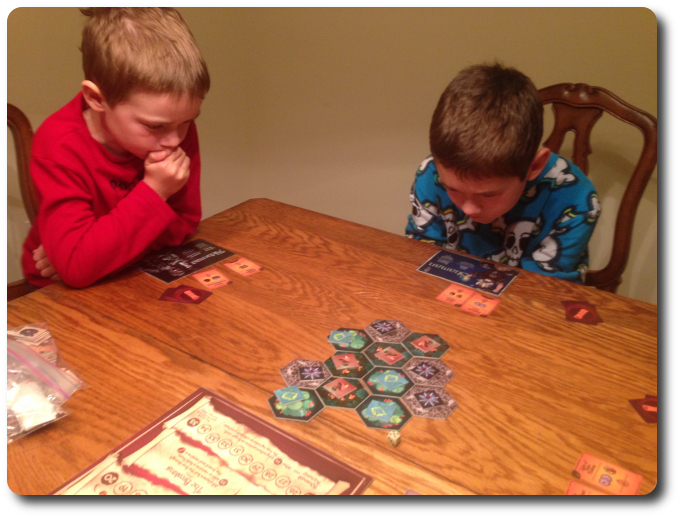 The Child Geeks understood how to play this game fairly quickly. It helps that most of the game uses images instead of text, making it easy to visually identify what is needed to make potions. The most difficult aspect of the game was the Market Season, where the Child Geeks had to balance victory points with strategic and tactical needs. According to one Child Geek, “I don’t like that I am spending points that I just worked really hard to get, but I guess that is meant to challenge us to get even more points.” Very true and this sentiment was shared by players in all our groups. Another Child Geek said, “I think the best part of the game is making the potions. The spells are nice, but I like collecting ingredients and mixing them up the best.” But not all the Child Geeks thought so. One Child Geek only wanted to cast the spells. According to her, “Spells are the best because they let you slow down other players. Potions take too long.” Hilariously, “potions versus spells” became a topic of debate and still rages on to this day. However, all the Child Geeks agreed that Cauldron was a game they approved. The Parent Geeks enjoyed Cauldron with both their families and their peers. The non-gamers had no problems understanding and playing the game, finding it to be visually appealing and very intuitive. According to one non-gamer Parent Geek, “I didn’t know what to think at first. Frog legs? Cobwebs? But it’s actually very easy to understand.” Another Parent Geek said, “This is a great, casual game. I can see this game being played by lots of different types of folks.” The casual and non-gamer Parent Geeks liked how smoothly the game transitioned from one season to another, but felt rushed at times. The more well-seasoned Parent Geek gamers found the game’s depth of play to be just the right mix of strategy and tactics. All the Parent Geeks enjoyed the game so much that they agreed to approve it. The Gamer Geeks, being elitists, did their very best to break Cauldron. And they couldn’t. According to one Gamer Geek, “The game is broken down into logical and meaningful steps. Each season has a purpose and the number of actions per round are always limited. I thought it would feel too simple, but it actually made me feel like I was climbing a ladder – advancing – as I was playing. That was very satisfying.” Another Gamer Geek said, “I was really surprised with how much thinking I had to do with the game. You can buy potions at random and just hope for the best, but you have to really think about what ingredients you are getting, how best to spend them, and when. I hate it when my ingredients spoil!” None of the Gamer Geeks particularly liked the stealing action, but acknowledged that it was useful. The Gamer Geeks also didn’t care for the randomness involved in getting new spells and potions. The game variant that removed luck and randomness helped a great deal to appease the Gamer Geeks. Finally, the gaming elitists found the different characters and their special abilities to be the icing on the proverbial cake, giving each player a unique position and opportunity to play the game in a way that set their decision making and actions apart. The Gamer Geeks thoroughly enjoyed themselves, finding Cauldron to be a game brewed with just the right mix of strategy, tactics, and depth of play. Cauldron was approved by the gaming elitists. Cauldron is a game about management. Players have to manage their ingredients and use them in a timely fashion or they will spoil. Players have to manage their opponents and make sure they keep their progress in check through the use of spells. Players have to manage their hard-earned Magik to purchase additional abilities and improve their harvest. Sounds like a lot, but it’s not overwhelming. The game’s designer broke each of these different aspects of management into seasons and made sure that the game flow always kept the most important aspect of the game play in front of the player without ever reducing the visibility of what was coming up next. This serves to create an excellent balance between immediate needs and long-term goals that feels both tangible and obtainable from the very start. One aspect of the game I kept thinking about is the Magik Track game board. I think there is more going on there than most players realize. An individual will continually take 1 step forward and 3 or more steps back in the game. This feels wrong but is essential to victory. Players are doing a lot of managing in this game and the Magik Track is just one more aspect of the game play the players have to watch. When an opponent passes a specific point on the Magik Track, the game changes for everyone and new opportunities and tactics become available. I really liked this because it kept the game changing, challenged the players to stay on their toes, and reminded them that this was a race. Cauldron is a very entertaining, challenging, and engaging game. It’s easy to teach and the game play is intuitive. Players are given very few options to being with and obtain more as the game continues. The gradual increase in difficulty gives players more than enough time to learn and adjust their game play as the game becomes more complicated to interact with. All of our players, from young Child Geeks to well-established Gamer Geeks, enjoyed themselves and I think you will, too. Do sit down and play this game when you have the time. Tagged Child Geek Approved, Economic Games, Fantasy Games, Father Geek Approved, Gamer Geek Approved, Parent Geek Approved, Prepublished Games. Bookmark the permalink. Great to hear that kids enjoyed the game as much as adults do. I’ve had a blast playing a prototype with adults. Good luck to the Cauldron developers! My 8-year-old daughter, a fan of all things Harry Potter, will love this game.Brewing potions, unleashing spells and defeating her dad will make for a fun afternoon.